The two things that come to mind when I think if Chicago are “the bean” and pizza. 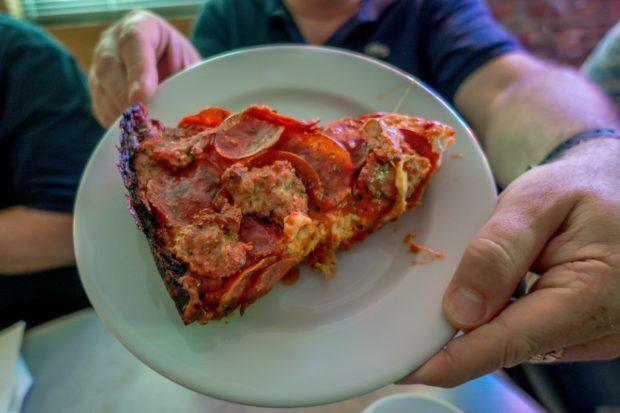 And despite the name, you can’t actually eat the bean, which makes pizza the perfect focus of a food tour in Chicago. 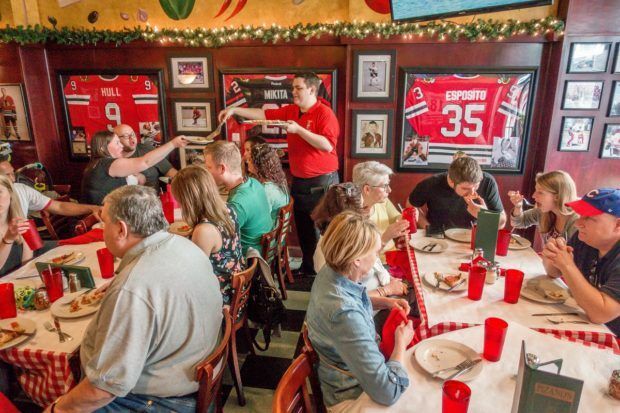 Three hours with Chicago Pizza Tours will take you to four of the city’s pizzerias to sample some of the best there is. And since you’ll be on their awesome bus, you’re not limited to places within walking distance from each other. Throughout the tour, you’ll learn about the mob, politics, and why it’s called the “Windy City” (hint: it has nothing to do with weather). 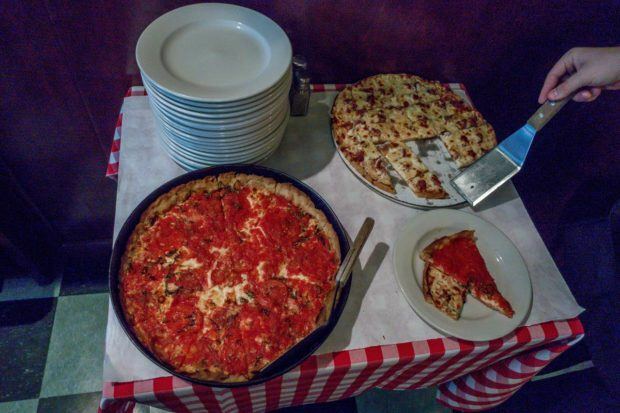 Here are a few other things I learned during my gluttonous tour with the pizza experts at Chicago Pizza Tours. Chicago is famous for its deep-dish pizza. 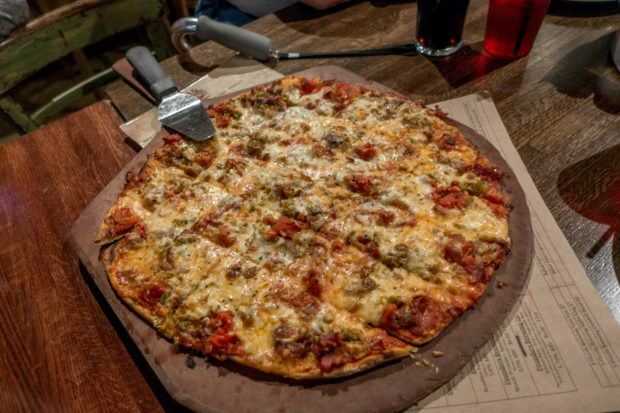 Its inch-deep crust is piled high with cheese, sausage, pepperoni, or pretty much anything else you can think of. Invented by Rudy Malnati, one of the Chicago pizza legends, many people think of deep-dish as the Chicago standard. But my Chicago Pizza Tours guide Jonathan enlightened our group that thin crust is three times more popular in Chicago than deep dish. 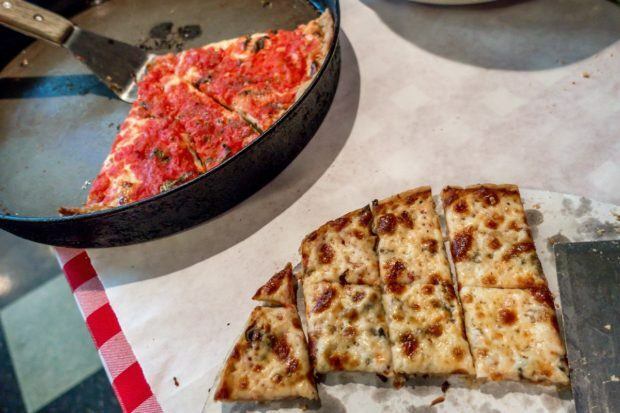 There’s also South Side tavern-style – made with a cracker-thin, salty crust – and pan pizza, a thick-crusted, cheesy delight made entirely in…you guessed it, a pan. Chicago pizzerias don’t just want to make a good product. They want to make the best product. And they’ll go to great lengths to ensure that their secrets stay secret. Our first stop was Pizano’s, owned by Rudy Malnati, Jr., son of the inventor of the deep-dish. Only three people know the recipe for Pizano’s dough, and one is Rudy Jr.’s mother who still comes in regularly to make sure everything is done to perfection (and based on the sausage and tomato slices we tried, it is). Pizano’s even has padlocks on the dumpsters so that no one can learn the secrets of their great pies. One distinctive feature of pan pizza is that in addition to its cheesy toppings, cheese actually goes outside the crust too. Slices of cheese line the pan before the crust and toppings are added. As the pizza cooks, the crust caramelizes and maybe even burns just slightly. Most of the people on my pizza tour couldn’t stop raving about the pan pizza we tried at Pequod’s, piled high with sausage. Get your knife and fork ready for this one! True Neapolitan pizza – as in the original pizza from Naples, Italy – is a hard act to follow. It must be made with high gluten, high protein dough, San Marzano tomatoes grown south of Mount Vesuvius, and mozzarella di bufala Campana made with the milk from water buffalo in Campania and Lazio, Italy. The whole process and ingredients have to be certified. Quite specific, no? Well, Coalfire Pizza does something similar without jumping through all those hoops. 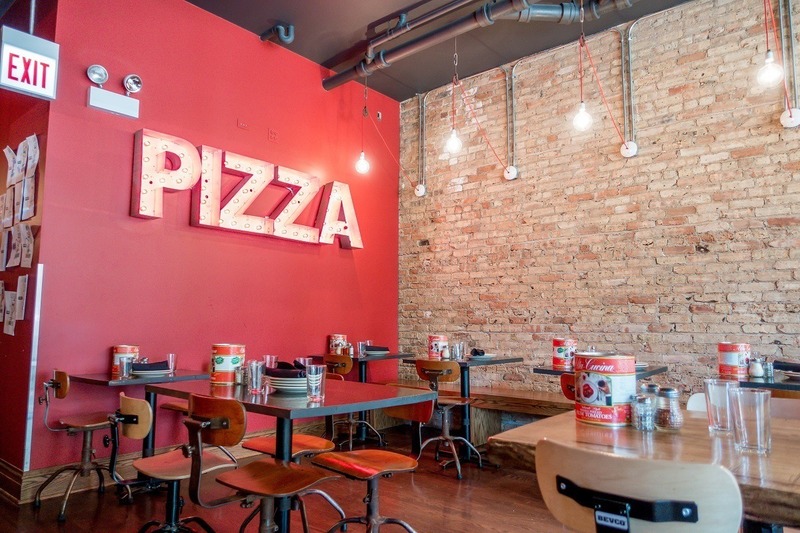 Their Neapolitan-style pizza is thin crust and uses plum tomatoes from the U.S. and Wisconsin cheese. It’s cooked quickly in their coal ovens so it emerges slightly charred on the bottom. Preparation to table averages about six minutes. It doesn’t get any fresher than that. Many Chicago pizzerias get their sausage from the same company, Anichini Brothers. Fittingly, their slogan is, “home of the sausage that made Chicago pizza famous.” But just because it comes from the same company doesn’t at all mean that it’s the same product. The pizzerias work with Anichini Brothers to develop their own sausage recipes. 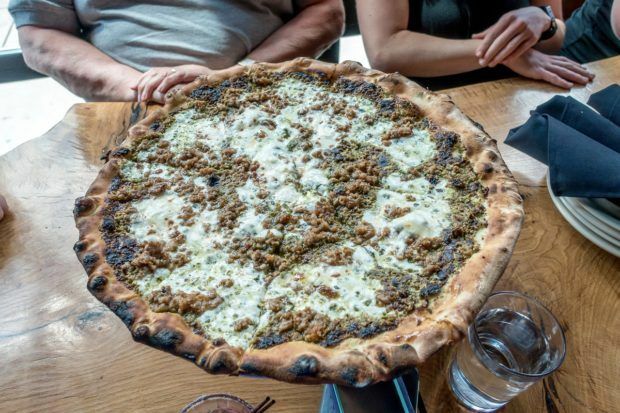 They vary the amounts of garlic, fennel, and spices to get just the right taste for their pizza and then order up the proprietary sausage on a gargantuan scale. Our most unexpected stop of the day was Flo & Santo’s in Chicago’s South Loop neighborhood. 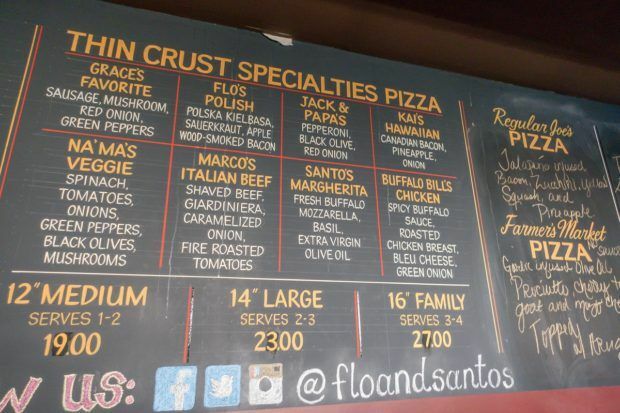 Flo & Santo’s combines traditional pizzas with a Polish flair. So you can get pierogies alongside your pizza and kielbasa on top of it. The first pizza we tried here was Flo’s Polish, a unique mixture of Polish kielbasa, sauerkraut, and applewood smoked bacon. Kind of unusual, but super delicious. We also tried Marco’s Italian Beef, which had slightly more traditional flavors, incorporating shaved beef, giardiniera, and caramelized onion. I always thought I didn’t really care for giardiniera. Turns out I just needed to have it on pizza. I was the guest of Chicago Pizza Tours. As always, opinions of the crusty and cheesy are my own.